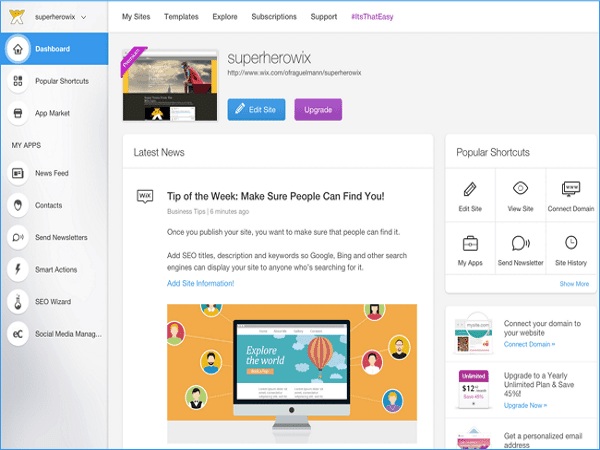 Wix allows basic users to build interactive websites that are visually striking and set you apart from the basic static templates. 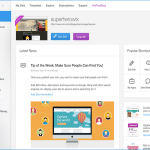 And you can build those interactive pages on over 510 stunning templates that all look designer built. Most of the templates are HTML5-based, which is a big plus since HTML5 is more SEO friendly and is compatible with Apply mobile devices. 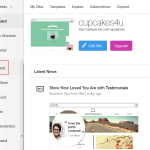 Since you cannot change a template for a website once you’ve chosen one, it’s recommended that you try out a few templates before starting to insert your own pictures and content. 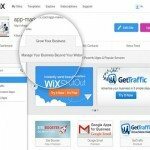 Wix is known for having a robust customer service team that is available through phone, email and through a forum. If you post questions to the forum, you have access to public responses as well as Wix’s team responses. Also, if you are a VIP plan user, you get direct access to their specialist ‘VIP Team’. 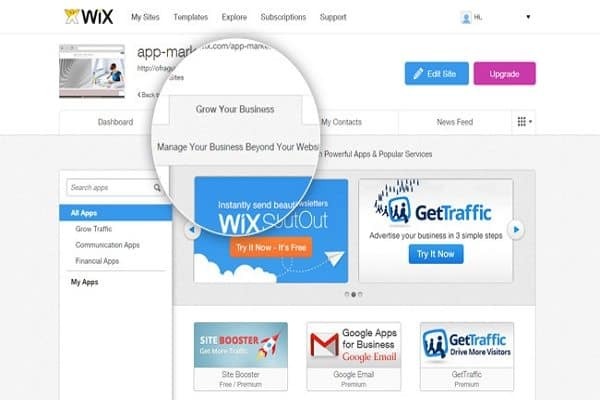 Wix also offers an App Market that most other website builders don’t. 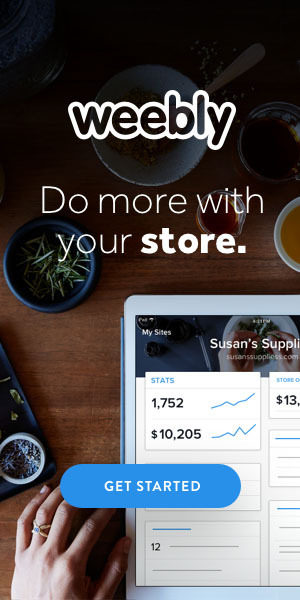 This app market with over 260 apps that you can purchase and integrate into your Wix site include tools that and services that extend functionality to help you build a better, more user-friendly site. Wix allows you to customize all basic SEO functions, such as titles, descriptions and keywords, which is right on par with most website builders. 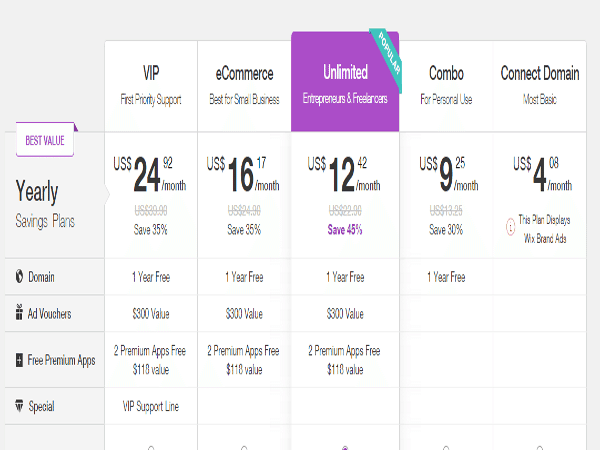 Wix also takes care of all your hosting and technical needs, so you won’t have to pay extra for that, even if you are not using their VIP plans. One downside is that you can’t remove the website from Wix if you ever wanted to change hosts. 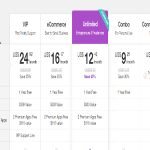 Wix Offers 5 Premium Plans, all plans provide free host and get premium support, the main different features with some plans in storage and bandwidth, the low level plan called Connect Domain cost $4.25/Month has basic features and This Plan Displays Wix Brand Ads and has 500MB storage, the most popular plan called Unlimited cost $12.42/Month provide unlimited bandwidth and 10GB storage and you can Remove Wix Ads, the high level plan called VIP and cost $24.92/Month and from its name you will get first priority support with many advanced features. 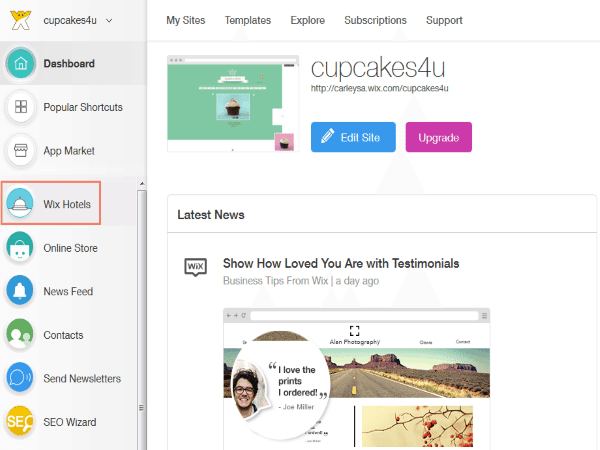 While you can try Wix for free and there is no pressure to upgrade, you will have to deal with advertising on the page. While Wix’s price points for their premium services are on the high end, we believe that once you have a chance to experience Wix’s platform and capabilities, it may change your mind. All things considered, if you are serious about having a sleek, visually appealing website for your business with extensive support options, the cost of Wix is not extraordinary. We highly recommended website builder.